Since being sick took so much out of me I haven’t really had the energy to make intricate meals. 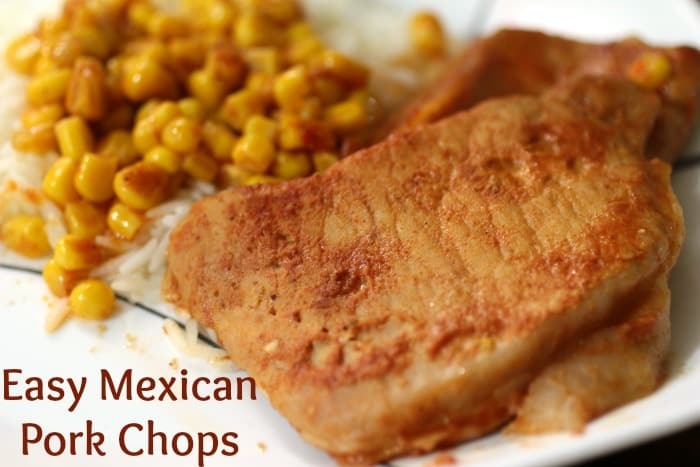 I’ve been trying to stick with easy food and these Easy Mexican Pork Chops were a life saver tonight. A few simple ingredients (whole kernel corn, tomato sauce and seasonings) mixed together with pork chops then served over steamed rice made for a complete meal. The beauty of this meal is you can clean up or relax a little while the Mexican Pork Chops are cooking. The flavor is out of this world; my son told me “There’s a fiesta in my mouth!” and the addition of corn adds a pleasantly light sweetness to make it a full meal. I used Allen’s whole kernel corn which is amazing. There were no leftover hulls of corn like some other corn leaves behind which is a huge bonus. The corn has a great flavor – sweet but not overly and a wonderful texture. I have other Allen’s and Trappey’s products in my pantry that I have big plans for. I’ll be using the black beans for my next Taco Casserole. These are definitely brands you want to check out and stock your pantry with. So, let’s find out how to make some easy Mexican Pork Chops, shall we? Lay the pork chops on the bottom of a casserole dish. Combine the seasonings with the tomato sauce and pour over the pork chops. Cover the casserole dish with aluminum foil and bake for 45 minutes. Carefully remove the dish from the oven and stir in the can of corn. Return to the oven, uncovered and bake for an additional 15 minutes. 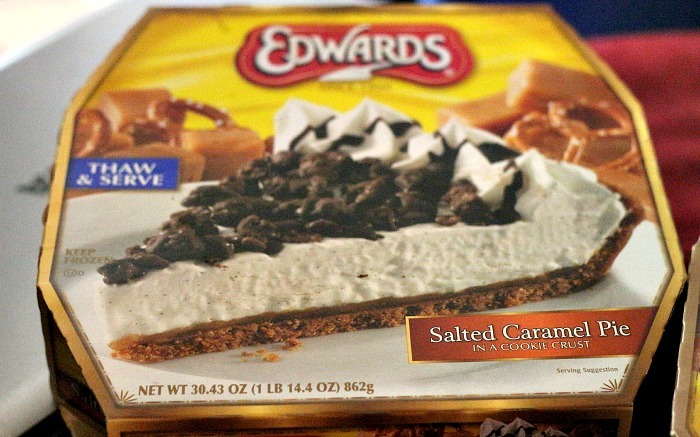 Holiday desserts are highly sought after. That’s an understatement; sometimes I think the only reason we eat dinner is for the desserts. 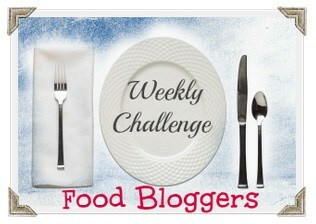 What about you – do you fill up on holiday dinner or do you make sure to save room for dessert? While there’s something to be said about those who spend days preparing cakes, pies, cookies and other sweets for holiday desserts, it’s not always fun. As someone who spends close to a week shopping, prepping and baking these sweets I can honestly say I’d love a break. 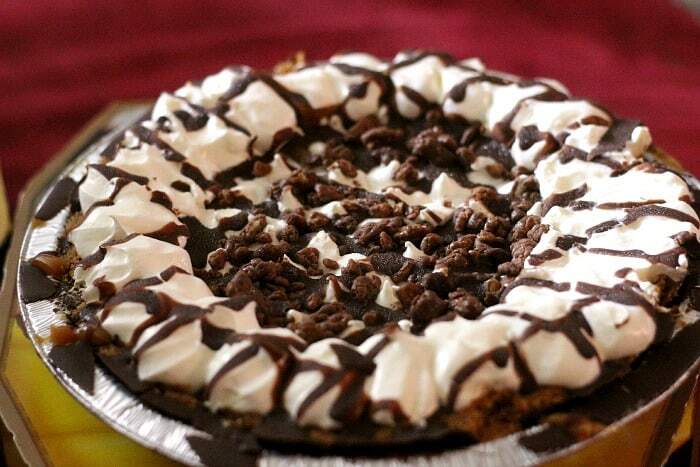 I’d love to find a dessert that is worthy of the dessert table that I don’t have to put so much time into. Tortuga, probably best known for their Rum, has a dessert that will leave rum lovers hungering for more. Their tender, impossibly moist cakes come ready to serve up to your holiday – or non holiday – guests with pride. 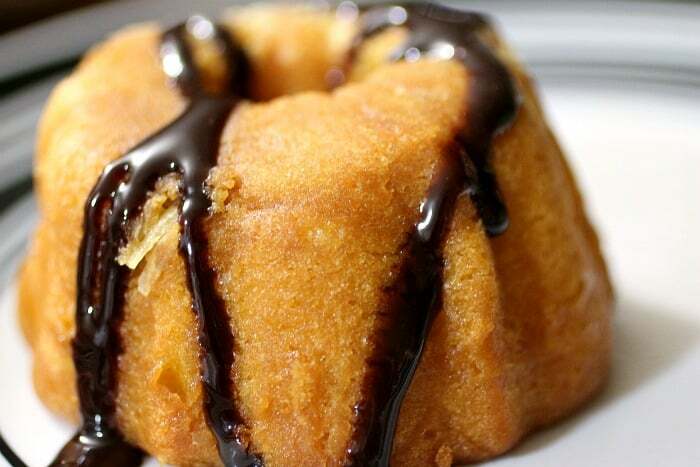 While most rum cakes leave you wondering if they’re even worthy of the name, Tortuga Rum Cakes most certainly earned their name. I was able to sample a Six Pack variety of Tortuga Rum Cakes with my family and friends over our holiday festivities. John was the first to try them and his initial response actually made me hesitate to try them myself. From just smelling the rum cakes his eyes widened. Tasting led to the same wide eyed result. He actually had to pick up the box to see if there was a proof listed. The rum has a very noticeable presence in the cakes. The first bite of the Tortuga Rum Cakes packs the most punch. Afterwards you find yourself automatically sending the fork back in for more and more. I have never had a pre-packaged cake as moist as these. There is not a dry or flavorless bite to be found in these rum cakes. I think it’s more of a surprise when you take the first bite; you’re not expecting that vibrant rum flavor – especially if you’ve never had a real Rum Cake. While I have yet to visit the Caribbean, the flavors in these rum cakes give me a pretty good idea of what it would be like. I’m a huge fan of tropical fruits: pineapple, coconut, mango, papaya…did I mention I love Pina Coladas?! The variety pack comes with 6 4 oz. rum cakes in Original Golden with Walnuts, Chocolate, Coconut, Key Lime, Banana and Pineapple. The fact that there are real pieces of fruit in these cakes make me swoon. The flavors were mild compared to that of the rum, however they were still obvious. My favorite was the banana (I’m a sucker for anything banana) while John loved the Key Lime. Even my son wanted to try some, although I was a little hesitant. I didn’t think he would be able to get past the rum taste and I was a little worried about giving him rum. John reminded me that I cook with alcohol often and I should know the alcohol cooks away. So I gave my son his own rum cake in what other flavor than chocolate? He loved it – ate every last crumb and licked the plate. 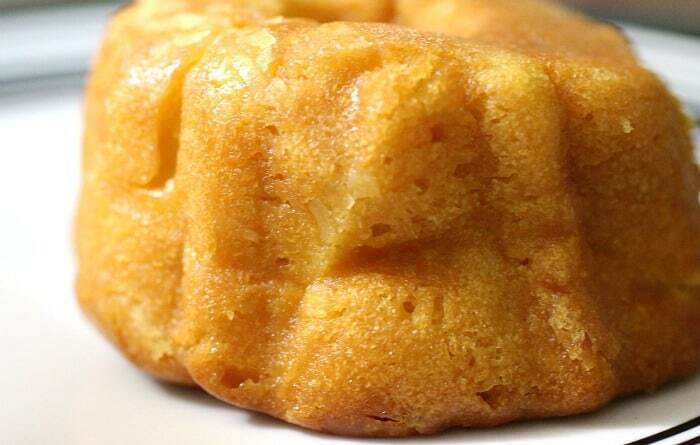 Something I did with the Rum Cakes that helped tone down the intense rum flavor was add an accompaniment to them. I drizzled my sons chocolate rum cake with chocolate syrup and added a dollop of whipped cream. I used crushed pineapples on the Pineapple rum cake and a banana foster type topping for the banana rum cake. The cakes are great without the additions but they really come to live with the addition of those special ingredients. If you’re looking for a new tradition for your holiday gatherings or you just have a craving for the Caribbean then head over to Tortuga Rum Cakes website and see everything they have to offer. You can also connect with Tortuga on Facebook and Twitter. Have you ever tried a meal replacement bar that promised a delicious experience only to be disappointed? Chances are high that you have and let’s face it – not many meal replacements are actually tasty. Sure, some are better than others but still nothing great. If I’m replacing a meal with something I want it to be worth it; and not just because it has fewer calories, fat and/or carbs. I’m always open to new things but there’s not much new with meal replacement bars. You can wrap them in pretty paper, throw in a few different ingredients but most still taste like you’re eating a cardboard box, am I right? There’s not much motivation to keep eating them regardless of how convenient they are. 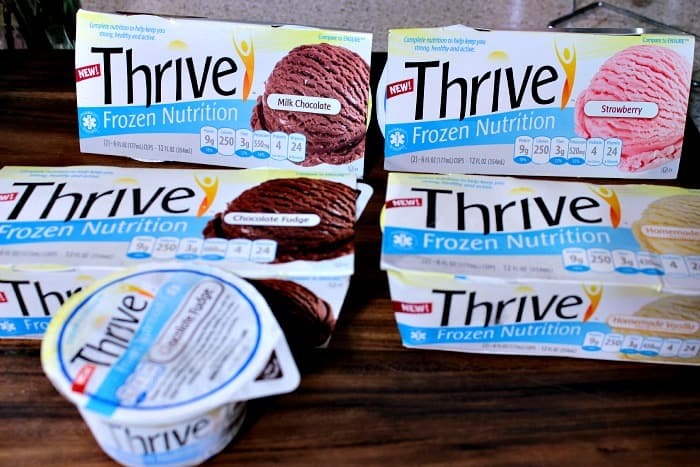 The fact that Thrive is an ice cream like product makes it the perfect vehicle for anyone to get the nutrition they need without sacrificing the things they love. 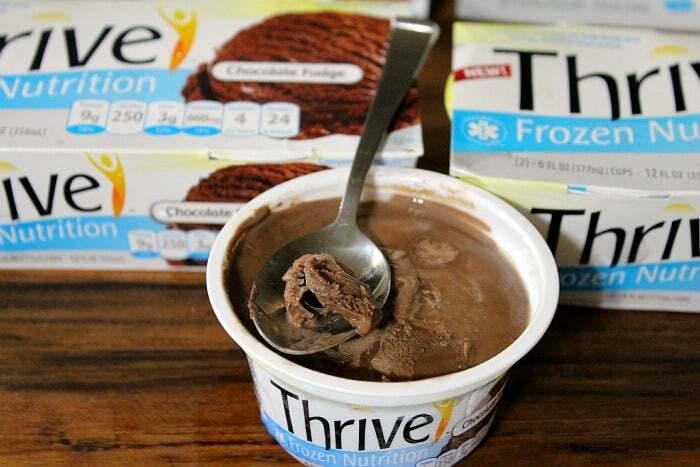 Thrive is available in Milk Chocolate, Homemade Vanilla, Strawberry and Chocolate Fudge flavors. I would compare Thrive to a frozen yogurt before an ice cream. The smooth, creamy texture is so similar to fro-yo you wont be able to notice the difference. I can’t think of anything negative to say about Thrive, it blew my socks off. The only issue I’ve found is a bit of a gritty texture if it melts; but it doesn’t normally stick around long enough to actually melt. As far as taste goes Thrive is out of this world. Forget any meal replacement product you’ve put in your mouth before. There is so much flavor and I’m talking about real flavor – not the artificial, fake wannabe flavors. Thrive is the real deal and my son doesn’t want to eat anything else. He begs to have it for dinner and I will admit I gave in one night. It leaves you feeling full – but in a good way – and without the guilt. If you’re sick of eating cardboard, need something tasty on the go, have trouble getting the nutrition you need or have picky eaters Thrive is the answer. I can highly recommend Thrive to anyone and everyone and yes, it really is that good! Thrive is still being introduced so if it isn’t available near you you can order it online. You can also connect with Thrive on Facebook to stay up to date on the latest news and products. I received samples of Thrive to try to give an honest review. All thoughts and opinions in this post are my own. The first time I saw Quinoa in the grocery store I had no clue what it was. It wasn’t until a year or so later at a family get together my vegan step brother-in-law filled me in. The first thing he pointed out was my pronunciation – it was all wrong. I pronounced it Quin-oh-uh; an honest mistake, right? It’s actually pronounced keen-wah and is an amazing food! 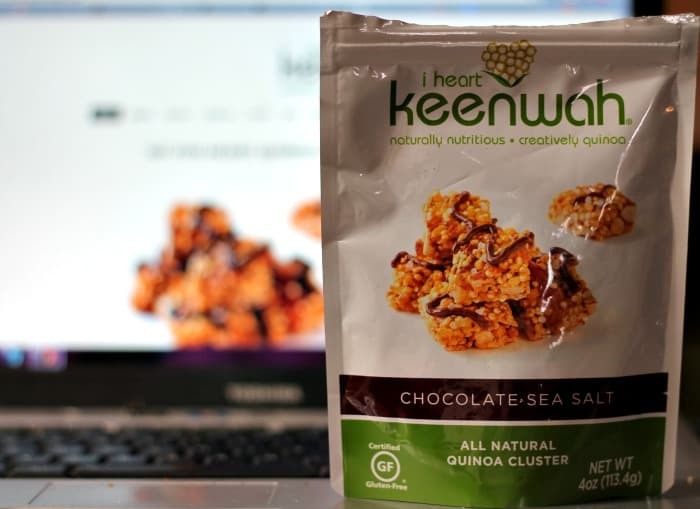 When I had the chance to review a product from I Heart keenwah you know I jumped at it. I have been cooking Quinoa and making it a part of our meals for about a year now. I love the versatility of it – use it as a side dish, create a dessert, make it a main course – the possibilities are limitless. The sample I received was Chocolate Sea Salt Quinoa and I can honestly say it’s delicious. 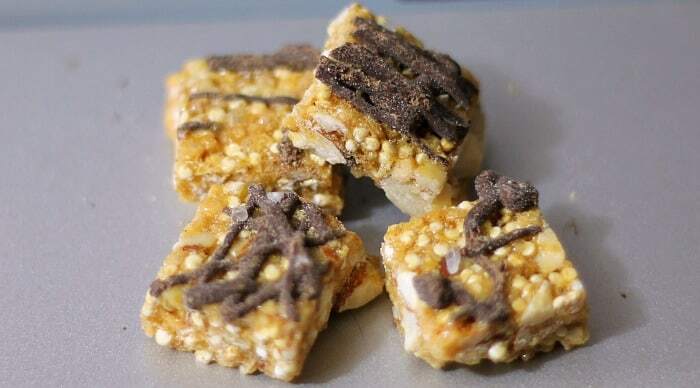 It has a wonderful crunch and a toffee like coating. The combination of ingredients make it a snack that’s not too rich but has just the right amount of sweetness to be great for dessert. They come in bite size square portions that are great for kids to pick up and eat. They are a little too hard for younger kids, but for older kids it’s a wonderfully healthy snack or dessert. This is also a great treat for anyone who is Gluten intolerant as it’s all natural and gluten free. It does contain almonds and soy so be aware if you have those allergies. I can whole heartily recommend the Chocolate Sea Salt All Natural Quinoa Clusters to anyone in need of a snack that wont leave you disappointed. 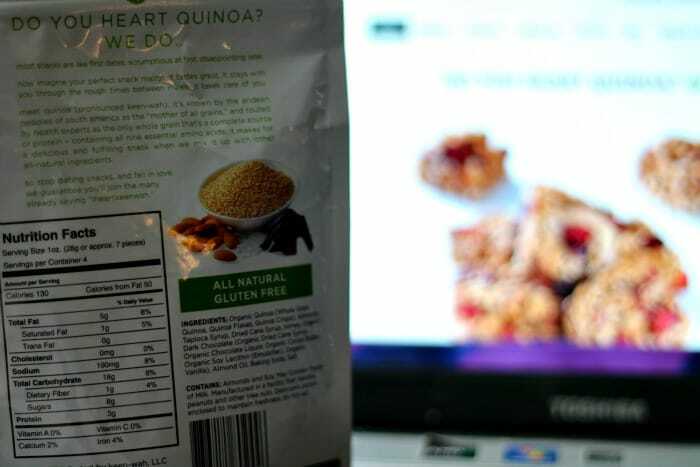 You can find get these and other Quinoa based snacks from the I Heart keenwah website. You can also connect with I Heart keenwah on Facebook and Twitter! Disclosure: I received a bag of Chocolate Sea Salt Quinoa Cluster from I Heart keenwah at no charge for the purpose of this review. All thoughts and opinions are my own.